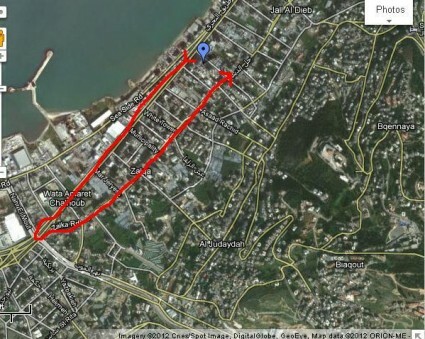 Let’s take down Jal el Dib’s Bridge, and then what? We are all very happy that the government and head of the council of development and recontruction decided to dismantle the Jal el-Dib metal bridge within 5 days, but did they think about the extra traffic that closing this bridge might cause? 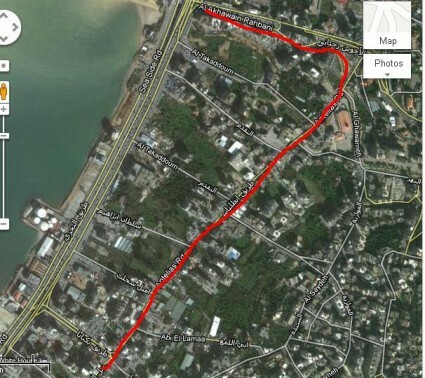 – People coming from Zalka towards Jal el Dib to get back on the highway leading to Nahr el Mot/Dora/Beirut. 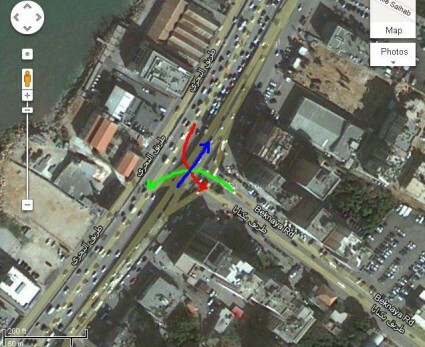 While cars pass under the bridge in the colors mentioned above, the Blue line corresponds to the normal flow of cars that cross the bridge coming from Dora/Nahr el-Mot/Beirut. The traffic in Antelias and Nahr el Mot is already agonizing in the morning, so closing down the bridge will make even worse. – Dismantle the current bridge and setup a temporary metal one until the new bridge is ready. This should be done within few days time as it was already done in the South after the July war and the bombing of several bridges. This would slow down traffic but is better than nothing. If this option is not feasible, and the new bridge will take few months at least to be finished, then maybe we should all sell our cars and buy bikes. Dude, aren’t you the one who kept reminding us about the condition of the bridge? Nothing gets fixed easily, akid there will be traffic bas bridges can’t be re-built in some magical way without causing the slightest of traffic! We all know what’s going to happen, but at least in the end it will be better and lives will be saved. Write about that instead of stating the obvious. I posted back in October that the bridge is supposed to be taken down soon and that there are problems in the implementation of the new bridge mainly due to the municipality but I never imagined we’d be rushing its closure just because a building collapsed in Achrafieh. Like I said, there will be more traffic for a short while if you come up with the temporary bridge or close some roads but taking down the bridge just like that is not how it’s done. Contradictory posts as usual, your blog is becoming like a gossip blog, chill dude! Contradictory? Gossip? Ur comment makes no sense dude. The current jal el dib bridge is the temporary metal bridge -.- Also It is the best time to takeover the bridge the as the country is most packed either on the holidays or the summer if not now when ? Well some people don’t see it yet but in 10 days or so mnesma3 el sarkhaaa ….